Five days sailing east of the Northern Reach’s city of Gateway, if the wind favors you, there rises the first of a series of sixteen islands arrayed over the Auroral Ocean in a massive crescent that stretches southwards over hundreds of miles. The cultures across the islands are diverse, yet they all regard themselves as one people, the Tide Born, and owe allegiance to a single nation: the Kingdom of Sails. This entry into the Lands in Shadow series reveals details about the Kingdom of Sails, one of the nations that managed to resist falling under the Empire’s influence. The details are meant to be a starting point for campaigns set on the edges of Rûl, offering you information to spark your imagination and ignite your creative fires. You can use the material as written or adapt it in any way you choose to make it fit the stories you want to tell. 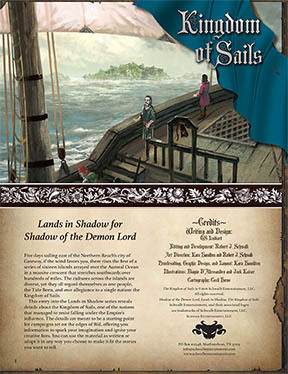 Pick up Kingdom of Sails as a PDF from Schwalb Entertainment or DriveThruRPG!